Kelsey Ramage is originally from Vancouver, Canada and holds about 15 years in the hospitality industry. In 2015 she moved to London to become head bartender at Dandelyan in London. On opening it won Best New International Cocktail bar” for 2015 at the Spirited Awards and moved 47 places to No. 3 in “World’s 50 Best”, in 2016 it took the title of “World’s Best Cocktail Menu”. In the 2017 Spirited Awards, it won "Best International Hotel Bar", "Best International Bar Team", and "World’s Best Bar". She went on to win the title of Global Champion for Olmeca Altos’ Tahona Society competition in 2016 and continues to work with the brand speaking about sustainability and tequila. In March of 2017 Kelsey and her partner Iain Griffiths paired up as beverage directors for WastED, a pop-up led by chef Dan Barber of Blue Hill farms. The dishes, along with the drinks, were made from ingredients sourced from major producers and local farms alike that would normally be thrown out. The pop-up received much recognition for it’s innovation in sustainability. In 2017, the duo paired up to launch Trash Tiki, a globally touring anti-waste punk pop-up that looks at food waste in the cocktail industry. 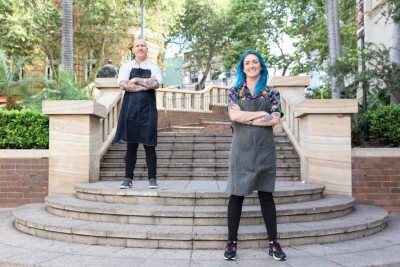 The duo repurpose ingredients normally thrown out from kitchens, bars, coffee shops, and commercial business that all contribute to the global food waste issue. They’re aiming to inject some fun back around the topic of "sustainability", with an inherently punk attitude, a playlist best turned up to 11 and an open-source website with all their recipes so everyone can be involved. Trash Tiki has now evolved into the Trash Collective, extending it’s anti-waste message across disco-rave nights called Wasteland Paradise, Trash Tiki pop-ups and over to bar consultancy and #antiwaste lifestyle. Kelsey continues to travel this year hoping to continue the important conversation about all that can be done to reduce the environmental impact of the food & drink industry. In 2018, Kelsey launched her own solo platform as well. Common Sense is a lifestyle food & drink project aimed at bringing elevated craft cocktails with an environmental sensibility into the home setting.